Good sturdy Cotswold School Peter Waals design oak combination chest/bookcase/wardrobes on base plinth, made by the Loughborough University final year furniture students for Hazlerigg Hall of Residences, Loughborough College, England; c1935. Each approx 79" h, 58" w, 23" d. Very slight variations in dimensions to each piece. as per first image below showing both. Made to a Peter Waals design, under his supervision and that of fellow Cotswold School designer and cabinet maker, Edward Barnsley; the former also being Head of Furniture at the College at the time. Very useful pieces of furniture! Exposed dovetails and wedged tenon detail to the sides. These were some of the superior & more elaborate ones made and designed, with a total of eight typical Waals raised fielded panels to wardrobe fronts and shaped curved Cotswold pierced D-handles. The units easily come apart for ease of transport etc. 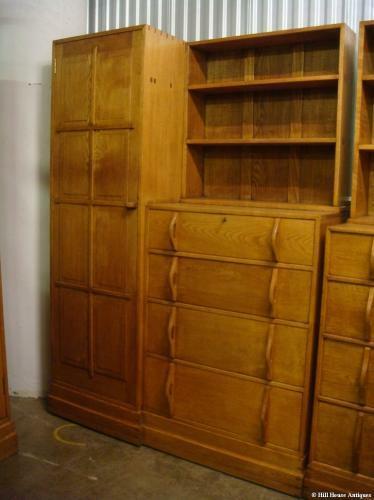 Or indeed can be used as separate stand alone pieces; chest of drawers, narrow single wardrobe and bookshelf!